The Centennial Olympic Games were a shining moment for Atlanta and greatly influenced the city’s development boom. As Atlanta celebrates the 20th anniversary of the 1996 Summer Olympic Games, it looks toward a future full of new development from hotels, stadiums and more. The convention and tourism district in the heart of Downtown will see great change in the coming years, creating a new experience for new and returning visitors to Atlanta. Atlanta will welcome Mercedes-Benz Stadium to the Downtown corridor in 2017. This facility will serve as home to NFL Atlanta Falcons and new 22nd MLS franchise, Atlanta United FC. It will also be the location of several marquee events such as the 2018 College Football Playoff National Championship, 2019 Super Bowl and 2020 NCAA Men’s Final Four. The stadium will feature a five-story, 360-degree high-definition video halo board that will be the first and largest scoreboard of its kind. 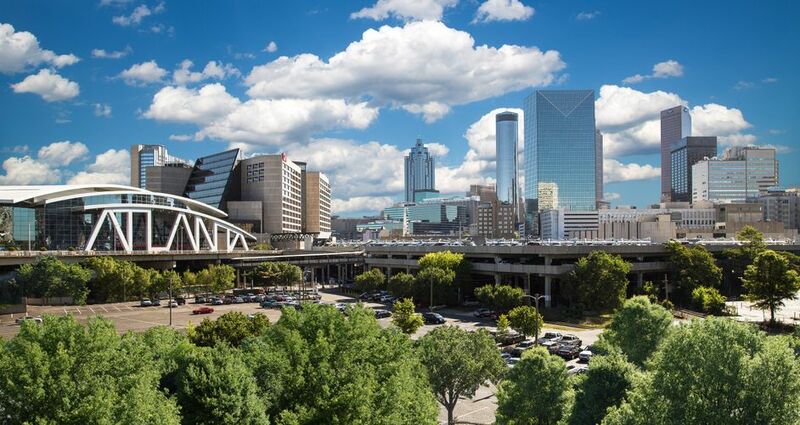 A pedestrian bridge is planned to connect MARTA's Vine City station to the stadium to further enhance the Westside neighborhood. Centennial Olympic Park will undergo a transformation of its own in late 2016 by creating a new pedestrian gateway to the Centennial Park District as well the expansion of the existing amphitheater and an added event space. It will continue to serve as the anchor to the world-class attractions that surround it like World of Coca-Cola, Center for Civil and Human Rights, Georgia Aquarium, Children’s Museum of Atlantaand CNN Global Headquarters. The number of hotels within the city will also expand. Atlanta has one of the top three fastest-growing hotel construction pipelines in the country, according to Lodging Econometrics. More than 9,000 hotel rooms are slated for construction over the next several years, adding to the city’s growing lodging portfolio. New construction includes a proposed hotel at the Georgia World Congress Center, a Hard Rock Hotel in Castleberry Hill and the transformation of the iconic Candler Building in Downtown to a Curio Hotel by Hilton. The skyline surrounding Centennial Olympic Park may change, but the legacy of the monumental event that put Atlanta in the international spotlight in 1996 lives on. Even 20 years later, the Olympics continue to shape the future of Atlanta.